Adventure and America go hand in hand. Our country is filled with tremendous places to explore nature's beauty and experience its thrills. At Just for Jeeps, we talk to dozens of customers every day who share stories of the incredible places they found, whether it's a skyscraping mountain peak, lush lakeside forest or even just a great diner on Route 66. Though we regularly drive on- and off-road across New England, we get excited to follow up on some of these recommendations hiding in plain sight. This is a beautiful country, and we love to express our pride for it with this patriotic spare tire cover. 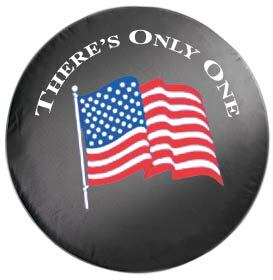 Emblazoned with an American flag blowing in the wind, its message of "There's only one" resonates deeply with us. The cover is made of durable material that installs over your Wrangler or Liberty spare tire snugly. It's made by OEM Mopar, the same company that makes tire covers for Jeeps you see on the showroom floor. And, like the people we meet across this country, it's durable, strong and protective. cover uses an elasticized closure which went on the 17" spare quickly AND snugly. My Liberty is dark blue in color. The flag and message really stand out and look great! ProsGood looking, easy to install. Should be relatively easy to remove in order to check spare tire pressure, etc. ConsNone that I have found. Sharp looking, patriotic touch to my ride! The exact size that I ordered was out of stock, but the J4J staff was very responsive in satisfying my order with a slightly different size that fits well and looks great! Thanks! This tire cover fits absolutely perfect and couldnt be easier to install and remove. Looks great and fits perfectly, couldnt ask for a better fit. Love the way it compliments the look of my Jeep Wrangler. ProsPerfect fit, easy on and off, good guality! Makes my Jeep look new again! Bought the spare "There's Only One" cover to replace the one that was on my Liberty when I bought it 10 years ago. Seems someone either was offended or wanted it more than I did. Either way, it was becoming faded after 10 years so the new one looks even better. Your web site is easy to use, especially since I'm "old school" computer-wise and often have trouble finding what I need. Easy to use & quick service. Thank you. Easy to put on and very sharp looking. Love it. Easy to install and fits perfectly. A quality product. ProsEasy to purchase. A good price. Very well made. Great fit. Looks good. Bought this cover for my Dad. He loves it! It was great material and fit the tire perfect. Highly recommend! ProsGood fit, has a nice weight to it. 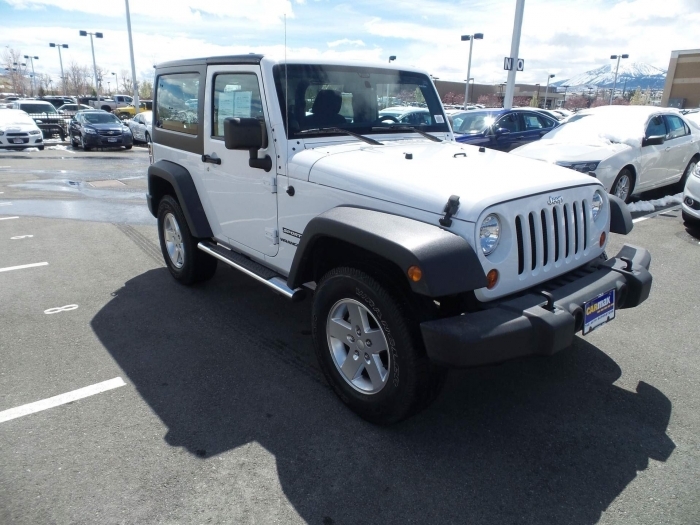 Just for Jeeps has great customer service. I was called to make sure I was getting the right size for my Jeep. ProsCan't find covers like this in stores. Item was as described, and of very good quality. I especially like the elastic as opposed to zipper closures. ConsPrice was a bit on the high side. It came vary quickly. The quality of the cover exceeded my expectations. My father will really appreciate this gift. ProsIt flaps in the wind. I like the sound it makes.